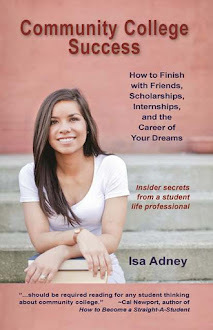 Community College Success: Ask Isa: Does prestige matter when choosing a college? Ask Isa: Does prestige matter when choosing a college? Below is a question from the anonymous Ask Isa inbox. Feel free to share your advice with this student in the comments section, and as always you can submit your own question to the Ask Isa column. I'm thinking about pursuing a career in business, and this is my second semester at my community college. I'm taking my General Education requirements now, and a few core businesses classes such as math and economics. So far these classes meet the requirements for my reach schools, UC Berkley and the University of Southern California (USC), and my back up school: California Polytechnic San Luis Obispo (SLO). I have read that it is less likely to get into graduate school with a degree from a California State University (i.e.SLO) rather from a UC. Financially, I'd prefer to go to SLO because the cost is WAY less than the cost of a UC, however I don't want this to hurt my chances of getting a job in the future. It just seems that UC's and private schools have more prestige over California State Universities. I still have a couple of semesters left to complete my requirements, I just want to have a clear path of what I am going to do so that I'll be motivated to accomplish my goal. Huge kudos to you for thinking about your path now, as a freshman. That will pay off big time - because you are right, having a path will keep you motivated. The more research you do about your direction in college the better. I live in Florida and am not an expert on the California college system, so my first piece of advice is to ask this question of someone who is. Meet with an advisor at your community college, admissions officers at all of the colleges you are considering, and any professors who went to the colleges you are considering. Share your dilemma with them honestly and ask for their advice. Take as much advice as you can and then think about what sounds like the best path for you. When it comes to figuring out the best college to help you get a job, I recommend seeking out someone in your local area who has a job that interests you in business, and ideally who has also gone to a graduate school that interests you. Ask him or her for advice and listen closely. The best way to choose a path with the end result in mind is to talk to people who have gotten to the place you want to be and find out what they did. They will be more than happy to help you if you just reach out. What I've learned from going to community college and meeting many successful people is that where you go to college matters much less than how much work you put into it - and how much networking you do.